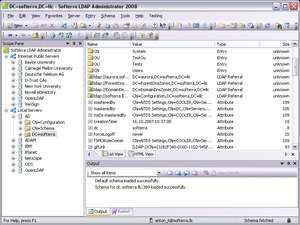 Softerra LDAP Administrator is a simple and easily navigable LDAP administration tool designed to work with almost any LDAP server including Active Directory, Novell Directory Services, Netscape/iPlanet, etc. Softerra LDAP Administrator significantly simplifies management of LDAP directories providing advanced directory search facilities, bulk update operations, group membership management facilities, etc. Customizable directory reports equip administrative personnel with information necessary for effective monitoring and audit. Directory data can be exported and imported in LDIF, CSV, DSML1, DSML2 and other formats. LDAP Administrator 2013.1 is a shareware program and can be used as a demo to try the software until the free trial period has ended. A full version of the program is available after the trial period ends. For security reasons, you should also check out the LDAP Administrator download at LO4D.com which includes virus and malware tests. Additional screenshots of this application download may be available, too. 4.72 out of 5 based on 7 ratings.